Near ideal growing conditions in North America, Europe and Asia have boosted prospects for the 2014 global harvest, forecast at over 2.5bn/t, and potentially the highest output in history for corn, wheat and soybeans, pressuring prices across the grain and oilseed complex, easing food inflationary pressures, while boosting upward-trending stocks. The Food and Agricultural Organization (FAO) confirmed that global food prices fell to a six-month low in July, helped by steep falls in grain and oilseed prices. problematic for farmers considering planting decisions in the next few months, but is expected to improve profitability and expected to encourage greater uptake by feed, food and industry processors. Global supply of cereals is expected to outstrip demand, while stocks are expected to rise to 415mt by the end of 2014/15. Rising soybean output in the US is mainly responsible for the large increase in oilseed production forecast at a record 522mt; the steep fall in the price of soybeans to encourage greater uptake of oil-meals, expected to increase to 280mt-increases in a number of countries but mostly reflecting rising demand in China. With the bulk of the large winter wheat crop in the Northern Hemisphere harvested rising estimates for Black Sea output, and good US spring wheat yield potential have combined to keep the pressure on prices as global grain exchanges hit multi-year lows at the end of July. USDA is forecasting global wheat output at 716mt, just surpassing last year’s record. Smaller crops in the US 58mt, following a severe drought, and in Canada 28mt-where plantings were sharply reduced in response to low prices offset by significant increases in China 126mt and Russia. Ikar raised its forecast for the Russian wheat harvest to 59mt. The quality of the large EU harvest of 148mt has been undermined by wet weather rain hampered wheat harvesting in western Europe, which slowed field work and lowered crop quality, particularly in France, but also in Germany, Poland, Bulgaria, and Romania, raising the question of how much of the crop in France will be of sufficient milling quality to sell to overseas markets-reports suggest as much as 50% of the French wheat crop is expected to be of feed quality. In the coming months, planting decisions for Southern Hemisphere and Northern Hemisphere winter wheat will be made in the face of rising grain stocks, falling prices, negative margins and potential losses that will weigh heavily on farmers planting decisions, especially those with higher production costs. Planting of the Argentine wheat crop is 90% complete while some analysts expected additional hectares excess rains have saturated soils in the central and southeastern parts of Buenos Aires province, likely to cut final acreage in line with last year. Meanwhile, Europe’s harvest woes and crop downgrades have helped support a strong rebound in Australia’s high protein wheat prices, improving the cash premium over the CBOT futures price by $10/t. While analysts believe the current CBOT price is getting close to ‘bottoming out’ further falls would have many Australian growers thinking about what to plant next season as margins tighten when prices drop below $220/t. Rabobank forecast that Australian grains and oilseeds are expected to outperform CBOT prices due to continued El Niño risk premiums and tight domestic stocks;Australia and New Zealand Bank forecast wheat price of $300/t in the first half of next year, driven by stronger prices and a weaker Australian dollar. Larger quantities of wheat are expected to be fed to animals in 2014/15 especially in the EU up by 9mt to 57mt, due to much greater availability of feed wheat, following the downgrading of a sizeable proportion of the French milling wheat crop to feed status, with smaller gains in the CIS countries notably Russia and Ukraine. SPECTRE OF INCREASING SUPPLIES PRESSURE PRICES AS RUSSIAN SALES LEAD THE MARKET Wheat prices surged on speculation that the volatile geo- political situation, between Russia and Ukraine could interrupt Black Sea export, which so far the flow of exports, have been unaffected. But the tense situation escalated through July and August. The EU and US imposed financial sanctions on Russia who in turn imposed a one-year ban on agricultural goods from the US, EU, Australia, Canada and Norway. The tensions in the region are unresolved, but have begun to wane as Russia pulled- back troops from the border with Ukraine. Overall, global wheat trade is expected to fall by 9mt to 151mt reflecting better domestic crops, less demand from North Africa, South America and a steep cut in Chinese imports. Reduced exports from the US, Canada, EU and Kazakhstan have been partially offset by larger sales from Russia and Ukraine expected to export 23mt and 9mt respectively and Australia 20mt; while Argentina’s exports (depending on government policy) are expected to rise to over 6mt this year. Russia is typically the price leader, during the first part of the season, and this year’s increased surplus is pressuring prices. Lower global prices also reflect ample supplies in other major exporting countries, a surplus of feed- quality wheat and weak corn prices. QUALITY DOWNGRADES TO FRENCH WHEAT LIKELY TO RULE OUT NORTH AFRICAN MARKETS Top-grade milling quotations were supported by reports of quality problems in Europe and the possibility that exports especially from France and possibly other European countries will be unable to meet Egypt’s strict import specifications. Trade estimates indicate that only one-third of French wheat will show the Hagberg number of 225 seconds required by the country’s usual export markets in North Africa, with perhaps half of the crop below the 180 seconds required for any milling uses. UK grain merchant Gleadell said that the revised specifications “would rule out North African milling markets,” and show “the magnitude of the problem faced by France this season.” The General Authority for Supply Commodities (GASC), the official grain buyer for Egypt, bought 175,000/t of Russian wheat (end- July) with prices c. $247–249/t bringing the total since the start of the marketing season to 0.89mt of wheat (355,000/t Russian origin) at a cost of more than $230m excluding freight. With Russian prices nudging higher, US wheat was the cheapest offer, but uncompetitive on freight. CBOT’s September contract closed at $5.33/bu ($196/t-13Aug); with UK Feed wheat November contract at new lows of £122 ($204.50-12Aug). Favourable growing conditions continue to support the outlook for abundant global supplies of coarse grains, boosted by a potentially huge US corn crop; larger global crops of corn and sorghum partially offset by a smaller barley crop. 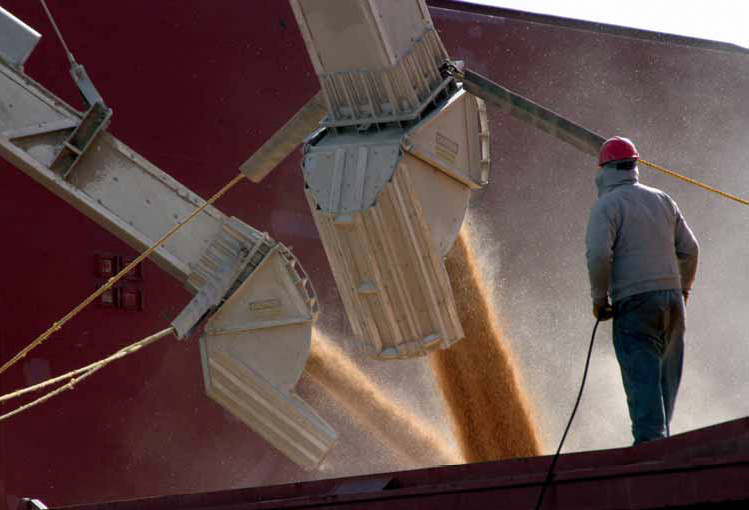 USDA’s provisional forecast for the global coarse grain harvest is 1,268mt (Corn 985mt, Barley 136mt, sorghum 64mt); strong demand for feed, is driving consumption, expected to grow by 17mt to 1,253mt (Feed use up by 15mt to 753mt, Food/Industry up by 2mt to 500mt), allowing further rebuilding of global stocks expected to rise to a fifteen-year high of 222mt. Global trade is expected to fall by 6mt to 148mt, mainly reflecting smaller imports into the EU,China, Egypt, Indonesia and SouthKorea. In recent years the high prices of corn stimulated production not only in the US, but also in the EU, Argentina, Brazil, China, Ukraine and Serbia. This year with corn yields well-above average in the US the crop is on track for a record c.356–380mt crop, and with better crops forecast for, China 222mt, the EU 67mt with a smaller crop in the Ukraine 27mt, are expected to lift global corn output to a record 985mt. USDA recently revised the estimate for US corn yields upwards to 167.4bu/acre, while some market analysts expect US corn yields to be well-over 170/bu/acre, which would imply an even larger crop. Both USDA and the International Grains Council (IGC) forecast a larger crop in China 222mt, and for its substantial corn stockpile to increase to 80mt, by the end of 2014/15; separately, Shanghai JC Intelligence Co, reported China’s corn crop being subject to drought, in the North China Plain, the country’s second-biggest producing region, with lower output in other provinces including Henan, Hebei, Shandong, Shanxi, Shaanxi and Inner Mongolia, fuelling rallies in grains traded on the Dalian Commodity Exchange-Corn September Futures Contract 2,517 yuan/t ($409/t-Aug 13). Rising domestic corn prices in China, by contrast to the steep fall in international prices of corn, and the competitive price of corn relative to other grains, are expected to prompt animal-feed producers to use other feed ingredients that may frustrate the government’s efforts to curb cheaper imports. With Brazil and Argentine corn crops, yet to be planted, output is forecast at 74mt and 26mt respectively, but farmers planting decisions likely to be affected by the significant fall in corn prices, and may switch to soybeans. Large corn supplies and much lower prices, are expected to increase corn demand for livestock feed by 18mt to 969mt mainly in China, South America, EU, US and CIS, the major producing countries, while food/industrial use is expected to fall by 1mt to 374mt (food 245mt, fuel 132mt). EPA EXPECTED TO INCREASE THE RFS’S ETHANOL REQUIREMENTS FOR 2014 The EPA’s final rulemaking for the Renewable Fuels Standards (RFS) is not expected to have much impact on domestic ethanol consumption during the year ahead, other than a possible small increase in consumption of E15 and E85. Domestic ethanol production is forecast at 14.1bn gallons in 2013/14 (ending 31 August), and is expected to be maintained or slightly above that level in 2014/15 marketing year, pointing to corn consumption of 131mt-132mt. Upbeat comments from companies like Valero, Bunge and ADM confirm they remain optimistic on ethanol prospects helped by weak corn prices, rising crude oil prices and stable exports, which have allowed ethanol facilities to maintain sizeable production levels and good margins, Mr Juan Luciano ADM President said ADM achieved great margins and volumes so far and expects “sustained margins for the rest of the year”. ROBUST DEMAND FOR US ETHANOL INCREASES SUPPLY OF DDGS US ethanol production is expected to rise to 14.3bn gallons this year, and aside from the 13.5bn gallons or so expected to be used domestically, the balance will be available for export opportunities; this year US ethanol exports will be helped by reduced competition from Brazil, and estimated to increase to 850m–1bn gallons. Separately Macquarie highlighted stronger- than-expected growth in Brazilian ethanol consumption and uncharacteristically much weaker exports in 2014/15.With an increase in corn use production of Distillers Dried Grains and Solubles (DDGS) for feed use is expected to increase to over 40mt. Last year US DDGS exports were close to 10mt, China and Mexico were top destinations for DDGS amongst several other importing countries; but China suspended imports of US DDGs amid concerns about contamination with MIR 162, a Syngenta corn variety cleared in Washington but not in Beijing, which has locked Chinese buyers out of the US market for DDGS-China’s trade accounting for 4–5mt almost half the total US exports, represents a significant loss, to Chinese feed producers and to ethanol producers as falling DDGS prices may become an anchor on ethanol producer returns-further sales of DDGS into the domestic market may already be at the limit in feed rations while any further tonnage would directly compete with huge supplies of domestic corn. US FOB (free on board) Gulf prices of DDGS have fallen since January from over $300/t to $181/t (8 Aug). By contrast to falling grain prices, meat prices — one of the components of the FAO’s Food Price Index — rose for the fifth consecutive month; international prices of meat have remained at high levels during the last three years, although the price situation varies among the different types of meat. Global meat production is anticipated to grow by 1% in 2014 to almost 312mt (beef 68mt, pig meat 116mt, poultry109mt) mainly concentrated in the centres (developing countries) of rising demand. Beef output is largely unchanged, while falling feed prices have helped to lower prices especially for poultry and pig- meat, both of which are expected to expand in 2014 — pigmeat output to grow by 1.1% to a record level of 115.5mt in 2014 — Asia is the leading pig meat producing region, accounting for more than half of the total. Strong consumer demand and government support policies are anticipated to boost China’s output by 1.6% to almost 56mt, representing 48% of world output. After limited growth last year, global poultry production is anticipated to rise by 1.6% to 109mt in 2014. Large increases in the Russian Federation and India, with gains noted in the US, EU, Brazil and Mexico. In China, currently the second largest producer, the industry continues to suffer from the after-effects of outbreaks of H7N9 avian influenza-production is expected to fall by 1.7% in 2014; weaker Chinese demand continues to encourage consumers to substitute red meat and fish for poultry, resulting in financial loss for the industry. RUSSIA’S ONE-YEAR BAN TO AFFECT TRADE IN LIVESTOCK PRODUCTS While global meat trade is forecast to increase by 1.4% to reach over 31mt in 2014 mainly due to more beef and poultry meat- poultry remains the main product traded, representing 43% of the total, followed by beef, pig and sheep meat. The recent one- year retaliatory ban imposed by Russia (6 Aug) on agricultural products from the US, EU, Australia, Canada and Norway includes-beef, pork, poultry, fish and seafood products, fruits and nuts, vegetables, some sausages most prepared foods, milk, and dairy. With countries assessing the implications, FAO, confirm the ban will increase prices for Russian consumers, but will also affect exporting countries by increasing stocks and depressing prices. Aside from the Russian ban, US sales of pig meat are projected to fall, partly as a result of Porcine Epidemic Diarrhoea (PED) limiting production; while the EU is facing a separate ban from January on pig meat exports to the Russian Federation, its main market, following reports of four cases of African Swine Fever (ASF) occurring in Lithuania and Poland. With corn prices pressured to their lowest levels in nearly four years in major exporting countries like the US, shipments from a delayed corn harvest in Argentina were expected to coincide with shipments from Brazil’s near-record second crop intensifying competition with US and Ukrainian new-crop supplies. But recent chatter that Argentina was limiting corn exports or rejecting export licences until the value of the peso is more certain has had little effect, given the market is well- supplied with US or Black Sea feed grains; the corn market is still trending lower in futures and spreads. Since May 2014, corn futures fell by over 26% — CBOT December Corn contract closed up at $3.70/bu ($145.66/t — 13 Aug), as buyers from Mexico, South Korea, Japan, Central America, as well as US domestic corn processors watch the US market for signs that global prices have ‘bottomed’, and are unlikely to fall further, before securing supplies. Japan is forecast to import over 16mt of corn this season with feed data confirming that the use of corn in animal feed production rose in preference to other grains such as sorghum, wheat and barley. Despite lower prices, global corn exports are expected to fall by 2mt to 117mt in 2014/15 down 6mt from last year, while stocks are forecast to rise to a fifteen-year-high of 188mt by the end of 2014/15. ANALYSTS CUT FORECASTS FOR CORN PRICES BUT ACREAGE REMAINS HIGH Goldman Sachs, cut their price forecast for corn to $4.25/bu, while Rabobank cut its forecast to $3.50/bu for the Oct-Dec period on the basis of a record turnout for corn. Since July, speculators turned bearish on the outlook for corn, for the first time since 2010, as bets on corn’s decline rose. But, despite lower returns to growers, which for some are said to be below the cost of production, North American manufacturer and distributor of agricultural fertilizers, CF industries, “projects that 92m/acres of corn will be planted in 2014-lower than last year but still historically high” and above the 90m/acres USDA has forecast in their long-term projections. Corn futures gained after USDA’s production and yield forecasts failed to meet analyst expectations Chicago Corn futures for December lot stood at $3.70/bu ($145.66/t — 13 Aug). Smaller harvest is expected in a number of barley producing areas EU 55mt, Canada, Argentina, Australia with output forecast at 137mt down by 5mt from last year. Feed use is forecast to fall by 6mt to 91mt, with global trade similar at 20mt; Middle Eastern and North African countries responsible for the bulk of imports especially Saudi Arabia forecast to import 7.5mt this year, Iran to double imports to 1mt and China’s imports expected to fall to 3mt. Like other feed grains, barley values have fallen dramatically-Quotes for French barley FOB Rouen ($203/t — 12 Aug); UK Feed Barley Merchant Nov £101–111/t ($170-187/t — 7 Aug). Increase in the planted area for sorghum, and better crops in the US 10mt, India 6mt, Argentina 5mt, Sudan 4mt and Australia 2mt, to boost global output to 64mt. Rising feed/food/industry demand, notably in Sudan, China, US, Japan, and Australia to increase consumption to over 63mt, with global trade expected to increase 7.7mt reflecting larger imports to Japan up by 500,000/t to 1.5mt and Mexico up by 100,000/t increased demand for imported feedstuffs-US sorghum — September delivery FOB Nola $219.87/t (8 Aug). With a much larger US soy crop forecast at 113mt, by far the biggest in history, while preliminary estimates for Brazil and Argentina soy crops — still to be planted — are forecast at 95mt and 57mt respectively, suggests a record output for soybeans as well as better crops for groundnut 40mt and palm kernel 17mt expected to offset smaller crops of rapeseed 70mt, sunflower seed 41mt, cottonseed 44mt and Copra 6mt, lifting potential oilseed production by 9% to a record 522mt in 2014/15. With an improving outlook for global oilseed supplies, lower prices and higher seasonal demand in the second half of the year, should further improve crush margins, according to Kuok Khoon Hong,Wilmar chairman and chief executive. Global oilseed crush is expected to rise by 11mt to 427mt, mainly driven by soybeans, the rise in crushings led by China and Argentina and also a number of other countries including, US, Brazil, Indonesia and Russia. LARGER SOY IMPORTS EXPECTED IN 2014/15 AS LIVESTOCK PROFITABILITY IMPROVES Oilseed trade is expected to rise by 1mt to 128mt, mostly due to increased imports of soybeans into China.And while USDA forecast Chinese imports of soya to rise to 73mt with domestic crush at 73.5mt in 2014/15, Shandong Sunrise Grain and Oil Trading, a large Chinese importer of the oilseed, forecast imports at 78mt, due to a sharp fall in the price of soybeans better livestock profitability and rising demand for feed. The improving situation with processing margins boosted by recovering profitability among Chinese livestock producers and bolstered by timely arrival of imports. Ample global supplies of oilseeds in 2014/15 are anticipated to ease international prices for oilseed and oilseed products, while replenishing stock levels in major exporting countries especially the US. Trade in oilseed meals is strong, the heightened pace sparked by falling prices has continued into 2014/15 with early season sales running more than three times above historic norms attributed to a growing availability of exportable supplies of meal. Global consumption of protein meals is forecast at 280mt, due to rising demand in China and in other Asian countries, Europe, US and Brazil. Rabobank forecast a “strong” recovery in prices of pork, China’s staple meat, from later in the July-to-Sept quarter, lifted by seasonal demand at a time when herd numbers are low. China’s pig herd, by far the world’s biggest, was 4.4% lower in May than a year before, with sow inventories down 7.5%, indicating weak potential for rebuilding the herd. With prospects for China’s pork producers “turning positive” after a very difficult first half of 2014, the bank said. China’s, effective, ban on imports of US DDGS, adds extra support to margins. DDGS a by-product of corn ethanol manufacture offers an alternative to soymeal as a high protein feed ingredient. But the reduction in 4–5mt of DDGS is expected to benefit soymeal demand, the increased volume positive for crushing margins. Chicago Soybean futures closed at $10.62/bu ($390.21/t — 13 Aug), US export bids, FOB Gulf, in July averaged $496/t —11 Aug. The fact, however, remains that governments in the past too were no less concerned about the cost of mounting imports of edible oils even when per capita consumption of oils was considerably below the world average raising concern about the nutrition level of common man. For example, the technology mission on oilseeds was first launched in 1986 with the objective of raising productivity principally by three ways. First, make available inputs and crop, region and climate specific technology packages to farmers. Second, produce sufficient quantities of breeder, foundation and certified seeds of different oilseeds crops. Third, help modernize oilseeds crushing and processing technologies to improve the quality and safety of oils. Edible oil imports could not but be a major point of concern since these are up from less than 1mt till 1994–95 to an estimated 11.10mt during the season to end in October 2014. Patel says in a “normal scenario,” Indian demand for edible oils will be 25.7mt in 2020/21, which will be met by domestic supply of 9.4mt and imports of 16.3mt. Indian Food ministry more or less agrees with Patel’s projections. India remains a story of growing dependence on imports to take care of its requirements of oils. The dependence has risen from 44% in 2001-02 to 60% in 2013–14. “What must not be lost sight of is that Indian imports surge is happening at a modest per capita oils consumption level of just over 14kg. The world average per capita use is 26kg, while in the US, it is close to 40kg. If 2001–02 is taken as the base year when Indian per capita use was 9.40 kg, the consumption rate is growing on the back of rapidly growing ranks of middle class which indulges out of home food consumption,” says Dhanuka. The rapid blossoming of fast food industry in India will be booster for vegetable oils use. According to research firm Crisil, the country’s quick service restaurant business a synonym for fast food will double in three years from Rs34bn ($550m) in 2012–13 to around Rs70bn in 2015-16. From McDonald to KFC and from Pizza Express to Pizza Hut, every global fast food major is rapidly opening outlets here going from tier one to tier two and three cities. Indian demographics — over 60% of the population is below 30 years of age and number of households with annual earnings of over $5,000 will spike from 81m in 2013 to 172m in 2017 — should lead to faster demand growth of edible oils than in the past. Like in developed economies, emerging countries like China and India have started experiencing faster rates of edible oils consumption growth in out of house sector than in households. Quoting from a research study, Patel says 80% of urban Indians eat out seven times a month, up from three times in 2003. Interestingly, per capita use of oils varies from a high of 22.4kg in Gujarat, the more developed among Indian states to 11.9kg in low income states like Bihar and Assam. One revealing set of statistics provided by Patel says between 2008–09 and 2013–14, Indian domestic production of oils rose by 0.93mt from 6.34mt to 7.27mt (14.7%), consumption by 4.22mt from 14.06mt to 18.28mt (30%) and imports by 2.92mt from 8.18mt to 11.10mt (36%). During this period, India’s imports of palm oil were up from 6.54mt to 7.78mt. In the Indian import basket, the share of palm oil in a year will range from 70% to 80%. The last few years are, however, marked by growing imports of soya oil and sunflower oil — 1.74mt and 1.43mt, respectively in 2013–14. The size of oilseeds production in two phases during summer-monsoon and winter of a season has an important bearing on the size of Indian imports of edible oils, says Dhanuka. Because of the poor start of the monsoon and continuing deficit in rains across parts of the country where summer-monsoon oilseeds are grown, production outlook does not look encouraging. The land coverage for major oilseeds till July end, according to official figures, was down nearly 19% to 13.7m hectares from last year’s 16.9m hectares. Soyabean coverage shrank by 18.47% to 9.539 hectares and groundnut by 23.01% to 2.837 hectares. But there still remains scope for recovery if, by mid-August, north and western parts of the country receive adequate rains. In the meantime, differential export duty pursued by Malaysia and Indonesia, which encourages export of refined, bleached, deodorized (RBD) palmolein at the cost of crude palm oil has become a major point of concern for palm oil refining industry in India. As imports of + RBD olein rose from 1.24mt in 2008–09 to 2.22mt in 2012-13, refinery capacity use in India is down to 37% on the basis of 300 working days. Indonesia is charging an export duty of 12% on crude palm oil, while it is 5% for RBD olein and nil if exported in packed form. Malaysia, the biggest source of import for India, allows duty free export of RBD olein, while it charges a duty of 5% on crude palm oil export. This is yet another example of resource nationalism in practice which wants maximum local value addition to raw materials, in this instance palm oil. Seeing the extra money to be earned by importing RBD olein, merchants in India are increasingly shying away from imports of crude palm oil. Indian government could still provide relief to refineries by recalibrating customs duty in a way as to incentivize imports of crude palm oil. The target should be to create an import environment that will lift refinery capacity use to breakeven level of 55%. In the past 30 years Brazil has emerged as one of the world’s leading producers and exporters of soya beans and meal, with output increasing by up to 8% a year, writes Patrick Knight. Now maize looks like it will follow the same pattern. More maize is now planted each year in Mato Grosso and other states of the centre west immediately after the soya planted in the spring, is harvested. In the past few years this ‘winter’ crop has become larger than what used to be the main,‘summer’ maize crop. Two or three million tonnes additional soya beans are now grown each year in Brazil, most planted in the centre west or north east of Brazil and most destined for export. In some recent years, Brazil has exported more soya beans and meal than the United States. Because of fast growth in demand for soya from China, which has long since ceased to be self-sufficient in the oilseed, two thirds of the 45mt (million tonnes) or so of the beans now exported by Brazil each year goes to China, which now buys ten times as much soya as it did a decade ago. Until now, China has obtained up to 90% of the maize it imports from the United States. But following the collapse of the US maize crop last year, many countries, including China, were forced to look elsewhere for supplies. Fortuitously, Brazil’s maize crop was extremely large in 2013, although only a few hundred tonnes of the record 26mt which were exported went to China, much of the rest going to other countries in Asia. Brazil has now been given the official go-ahead to export more maize to China, although it is not clear whether genetically modified maize, which forms most of what is planted in Brazil, will be admitted. If Brazil’s exports of soya beans have been growing steadily for 30 years, maize was first exported in a big way only five years ago. Before that, Brazil often imported maize, most coming from neighbouring Argentina. Maize exports have increased fourfold in the past five years, to exceed 20mt in three of the past four years and peaking at 26mt in 2013. Winter maize has long been planted in Parana state in the south of the country. But only in the past decade have large areas been planted as a winter crop in Mato Grosso and other states in the centre west. Farmers in these states now rush to get maize into the ground immediately after early soya has been harvested, as the weather often becomes either too dry, or frosts can damage plants, if sowing is delayed. So far, only about half of the six million hectares planted to soya in Mato Grosso state, Brazil’s leading soya producer, is also planted to maize in the winter, much more could be, if the demand were there. Millions of tonnes more soya and maize will be needed by China each year from now on, much of it to be grown in Mato Grosso, one of the few states where large tracts of unused land still remain. Maize is a far more bulky than soya, so while one truck can take up to 60 tonnes of soya to a port, it takes about 30% less maize. A tonne of soya beans sells for about $500, but a tonne of maize fetches only about half that, although it costs about $150 to get a tonne of either grain to a port. For the time being, exporting maize is far less profitable that soya. But because most of the farmers who plant maize as a winter crop, usually make large profits from the soya they grow in the summer, and with the same machines being used to plant and harvest both crops, fixed costs and overheads are reduced. Improving Brazil’s logistics has become more of a priority, with rivers being opened up, and new barge trains, terminals and storage built, while new stretches of rail track are opened to traffic. Both maize and soya, will soon benefit from lower transport costs, which are now far higher than in competitors the United States and Argentina. The year 2013 was as big test for Brazilian maize, because the severe drought in the US, usually the world’s leading supplier of the grain, meant the US had much less to sell. Many important maize importing countries were forced to turn to Brazil as an alternative source of the grain for the first time last year. Half a dozen countries in Asia, led by Japan, but also including South Korea,Indonesia,Malaysia,Taiwan andVietnam bought large quantities of Brazilian maize in 2013, as did numerous countries in the Middle East. These included Saudi Arabia, the United Arab Republics, Kuwait, Algeria, Morocco, Egypt and Iran, already a leading importer of Brazilian soya. Several countries in Europe, notably the Netherlands, but also Italy and Ireland, all bought maize from Brazil in 2013. Exporting maize was particularly profitable last year, not only because the shortage meant prices were high, but also because the Brazilian currency, the real, fell by about 18% against a basket of currencies during 2013. The weaker real meant that Brazilian maize was more competitive than for many years, when the currency was overvalued, which prejudiced exporters. Because of last year’s bonanza, many farmers have been reluctant to export so fast as they did last year, while about 6mt less maize will be produced this year than last years record crop. Because the soya price has been very high, many farmers have preferred the oilseed to maize as a summer crop 2013/14. For various complex financial reasons, largely the fact that the US economy has not grown as fast as had been anticipated in recent months, huge amounts of foreign capital has been flowing into Brazil this year. This has caused the currency to rise by 10% against the $US dollar so far this year, which is eating into the competitiveness of Brazil’s exports. Many farmers hope that some problem with the climate will damage US maize later in the year. But if the US maize crop is as large as is now expected, they may find themselves with an excess of unsold maize on their hands. Brazil is the world’s largest exporter of chicken, with almost 4mt exported each year, as well as being a major producer of pork. This means about 40mt of maize, as well as large quantities of soya meal is used in the country as animal feed. Brazil’s soya trade is very different from that in Argentina, again largely for financial reasons. While Brazilian farmers and traders get no financial incentive for exporting soya meal rather than beans, the Argentine government gives a tax incentives to farmers to encourage them to export meal rather than beans. As a result, Brazil crushes a far smaller proportion of its soya than its southern neighbour. A total of 45% of the Brazilian crop is exported in unprocessed bean form, while only 8% of the smaller Argentine crop leaves unprocessed. Although both countries produce about 28mt of feed, only 4% of the meal produced in Argentina is used locally, while just over half the meal produced in Brazil is used to feed the country’s large chicken, pork and dairy industries. While Argentina exported 27mt of meal in 2013, Brazil only exported 14mt last year. Although Brazil is self-sufficient in most grains, the climate is only suitable for growing wheat in a small area of the country, so it is one of the world’s leading importers of wheat. Half the 10mt consumed in Brazil each year, is imported. In most years, most of this wheat comes from Argentina, and wheat from there pays less import duty than that from the United States, or other suppliers in Europe such as Ukraine. Because Argentine wheat production has been erratic in recent years, however, more has come from further afield. Brazil is also a leading rice producer, and which 10–12mt are produced, grown on about four million hectares, the great majority in the state of Rio Grande do Sul. Most of the rice is usually consumed in Brazil itself, and if any imports are needed, they come from Uruguay or Argentina.